NOTE: Unfortunately, as of Spring 2015, Megaro King’s X has been shut down. We will miss it dearly. I’m glad I stumbled back into the Megaro Hotel after over a year. The garishly painted (yet not displeasingly so) building across from King’s Cross/St. Pancras is home to the Megaro Bar that does not get the credit it’s due. 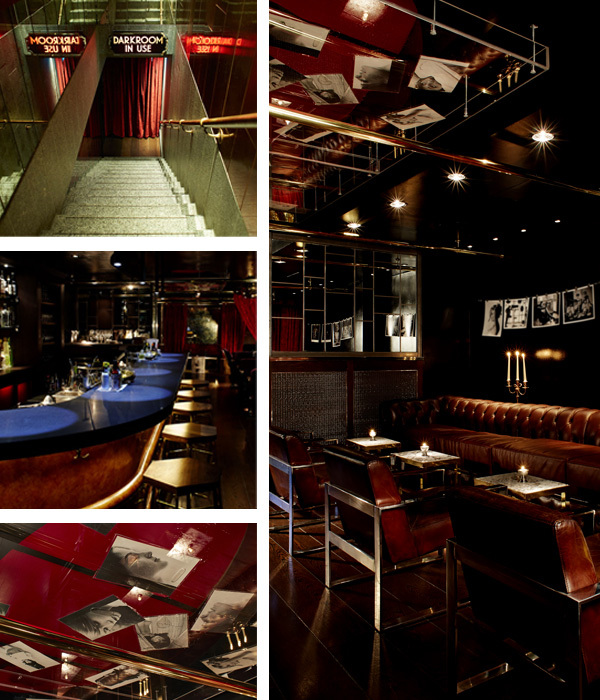 When you enter the building, you enter the hotel restaurant, then take the stairs into the basement searching for ‘Cocktails and Answers’ and take your seat in either of the glamour days of Hollywood themed Dark Room or the Picture Room. The Dark Room (my preference) is a dark, dimly lit space with auditorium seating and red velvet curtains galore. I adore this venue for quiet one-on-ones with friends or dates – especially the corner tables where you can completely draw the curtains around you for perfect privacy. The Picture Room, on the other hand, is a brighter space for hosting exhibitions (what you are forced to look at is luck of the draw) illuminated by cinematic lighting while you imbibe on director’s seats. 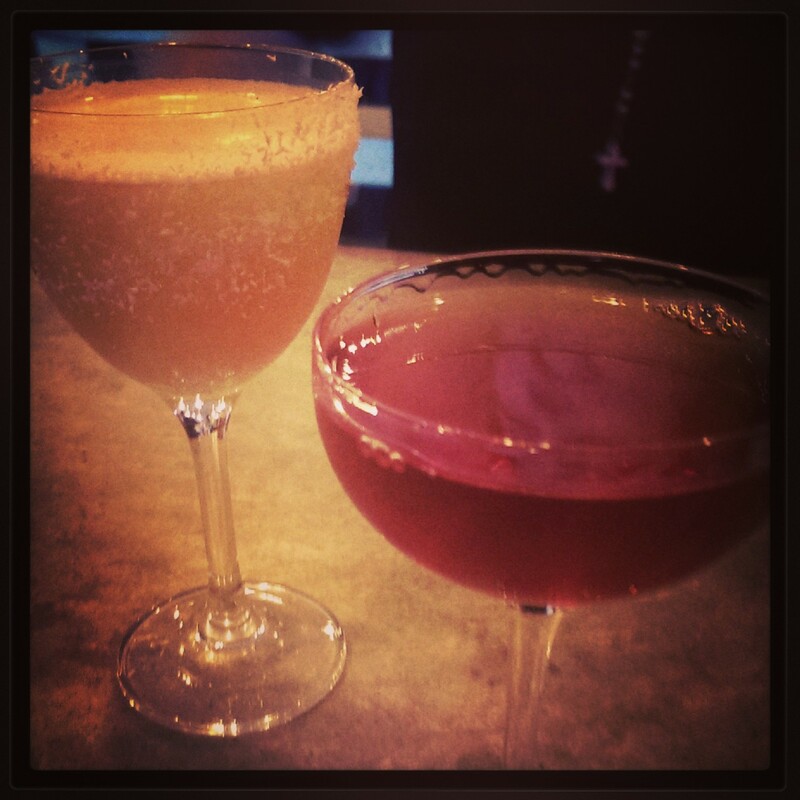 Among the Film Noir feel, the drinks are wonderfully modern; classics can be ordered off menu. The house cocktails , thankfully, stick to simplicity – knowing that in the world of drinking, less is more. The effortlessness emphasizes the harmony of the selected flavours, with a silent understanding that dandelion essence can be far more effective than ‘black pudding distillate’ (we all know of whom I speak). Each drink is as captivating and defiantly confident as one of the monochrome celluloid stars on the wall. It is difficult to choose a favourite here – on what was supposed to be catching up with a drink ended with us going through the entire menu without remorse. Reminiscent of the Zetter Townhouse, drinks are short, but intense in flavour. Anyone who knows me is aware that I’m not a fan of sweeter drinks, but even the sweetest on the menu, such as the Chinese Courage (Columbian aged gin, Chinese plum cordial) is on the ball. The Lost Steps (Ocho Blanco, cardamom sweet tea, Chartreuse elixir) is a tequila fan’s dream; the nose is strongly citrus, but the flavour shows very little, if any, hint of cardamom. The tea allows the notes of the tequila to unfold in a manner to savour the tequila’s various layers, smoothly and pleasantly. Three Feet Under is a spectacular work: Martell VSOP Cognac, Australian Stanton & Killen Muscat, bitters and white truffle honey. The muscat’s sweetness dominates the nose. On the palette, cognac does more for texture than flavour. It opens with the muscat, leading into a hint of citrus, and ending with a bang of the white truffle honey. Unique and definitely worth trying is the Glory Box (Somerset brandy 5yr, Maraschino, lemon sherbet, dandelion & burdock) – seemingly trying too hard at first glance, instead provides a devilishly complex and layered libation that unravels to the palette. Land of Grace (Diplomatico Reserva Exclusiva, 10yr White Port, clover honey) could easily be my favourite. Service is swift, attentive and worth commending. And ending the evening with a Book of Answers for a little game of Magic 8 Ball was a nice touch – somehow adding bit of a Punchdrunk Productions vibe. If there is any warning to be given, it is mind the disorienting mirrors in the WCs – there is no glamourous way to walk into one. All in all, the Megaro is a gem that pulls out all stops and is flamboyant where it counts. With impeccable service and drinks, it is a nice place to get away from the noisiness of the Gilbert Scott across the street and seclude yourself behind a velvet curtain. Worth a visit, and be prepared to bump into me.